You are required to renew your license by the last day of your birth month. If you do not renew by the last day of your birth month, your license is automatically placed on expired status at midnight on the last day of the expiration month. A licensee with an expired status shall not practice as a Registered Nurse or Licensed Practical Nurse. Prior to practicing, you will be required to reapply for licensure and will need to complete the Reinstatement application. If your license is not current, the right to practice nursing in North Carolina is forfeited unless you hold a multi-state nursing license from another Compact State. If a nurse practices nursing with a lapsed license, disciplinary action may be taken. An active North Carolina license is not issued when another Compact State is claimed as the primary state of residence. If you have declared another compact state as your primary state of residence, in accordance with the Nurse Licensure Compact § 90-174.84, you cannot reinstate your North Carolina license. Your North Carolina nursing license WILL NOT BE REINSTATED until proof of residence is received showing North Carolina as your primary state of residence. Once you declare North Carolina as your primary state of residence, you must immediately change your address via your Nurse Gateway portal. Submission of your online application should not be construed as automatic reinstatement of your license. The North Carolina Board of Nursing must verify that you have met all the conditions for reinstatement before your license is reinstated. Licenses are valid for two (2) years. For reinstatement of a license, licensure may be for less than two (2) years in order to place the expiration on your birth month. Create a Username and Password to access your information and applications. If you have already created a Username and Password, you will only need to log in to your profile . Please keep your Username and Password in a secure location as you will need this information to access your Nurse Gateway profile. Apply for licensure by reinstatement ($100.00 - Inactive Status or $180.00 - Expired Status) with the North Carolina Board of Nursing. To apply for licensure by reinstatement, access your Nurse Gateway profile and select the 'INACTIVE' or 'EXPIRED' tile which indicates your license under the 'Licenses/Approval to Practice/Certifications' tab. Select 'Renewal/Reinstatement' on the following page. *Per N.C.G.S. 25-3-506, a $25.00 processing fee will be charged for a Electronic Check (E-Check) refused by the bank due to insufficient funds or closed account. You held a nursing license in North Carolina or another state within the last five (5) years OR have completed a Refresher Course within the last year, which has been approved by the North Carolina Board of Nursing. A Criminal Background Check is required for all reinstatements. If your North Carolina nursing license has been lapsed less than 30 days and you wish to retain your multi-state status, a Criminal Background Check is required within 30 days. Live Scan is only available to applicants living in North Carolina. If you reside in another state or country, the Criminal Background Check packet will be mailed directly to you the following week after submission of your application for reinstatement. If you have been charged or convicted of a felony or misdemeanor or have any charges pending whatsoever (which have NOT been previously reported to the Board); or if you have any charges or actions against any professional license (which have NOT been previously reported to the Board), submission of additional documents will be required before your license renewal can be processed. If a Criminal Background Check or additional documents are required, your online renewal application will be processed within 6 - 8 weeks. If you're requesting reinstatement following disciplinary action by the North Carolina Board of Nursing, call (919) 782-3211 ext 271. Upon successful completion of the online application, you may check your application status via Nurse Gateway . Licensure information can be verified on the Board's website. 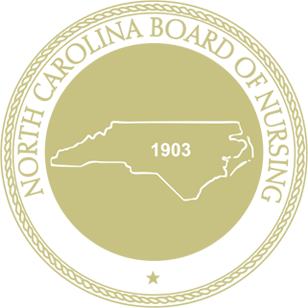 The Board of Nursing’s electronic database serves the primary source of licensure information for nurses in North Carolina. The Application Confirmation which serves as your official receipt will be available on your Nurse Gateway profile upon successful completion of the application process. To access, select the appropriate tile under the 'Licenses/Approval to Practice/Certifications' tab on the Home screen, then select the 'Files' tab on the License Information screen. If your email address is listed with the North Carolina Board of Nursing, you will receive a confirmation via email verifying receipt of your online application. If you are renewing your Registered Nurse (RN) license, the Registered Nurse license does not allow you to practice as a Nurse Practitioner or Certified Nurse Midwife. You must renew or reinstate the advanced practice approval separately from the Registered Nurse licensure. If you are renewing your Registered Nurse (RN) license, the Registered Nurse license does not allow you to practice as a Certified Registered Nurse Anesthetist. You must verify your certification status with the North Carolina Board of Nursing initially, and thereafter on a periodic basis concurrent with the CCNA renewal cycle. All nurse anesthetists are expected to renew their National Certification biennially in July. Approximately 60 days prior to the expiration of the National Certification, the Board of Nursing will mail you a notice to update your North Carolina Certified Registered Nurse Anesthetist recognition and to provide your current National Certification number and expiration date to the Board of Nursing.